It is not what you think or what someone else thinks, but what I think, says the LORD. My thoughts are higher. Come up higher. Relinquish the lower, and step up! Do not drag you feet or wade through the mire. My higher thoughts will bring you to a new level, and never down. My thoughts are good thoughts, creative thoughts, and good plans for your life. Shake off the illegitimate, condemning, condescending thoughts and renew your Mind and thinking with My thoughts. For you will go in the direction that your thoughts take you, and limit yourself to that which confines you to what you see, feel or hear in the natural. Step into the light of a new day and fill your mind with My limitless wisdom, knowledge and understanding, says the LORD. 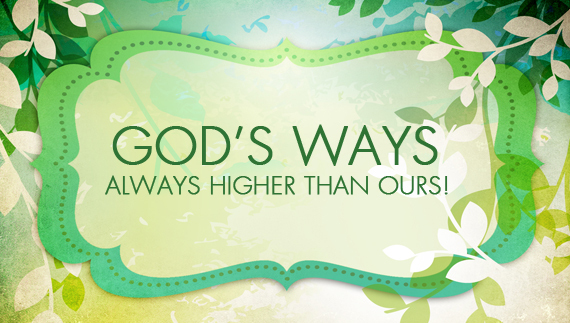 My ways are higher than yours, and I want you to move forward into MY WAYS. Come out of your comfort zone that only keeps you stagnant and unproductive. The new is before you. The past is not the way to go. I Am ahead of you, preparing the New for you. I know the way and have cleared it for you. TRUST ME! The forms and formulas of the past will not be fitting for the new. Shed them and get ready for a new and exciting adventure in Me. Take the steps before you, daringly, faithfully, and KNOW that I will never fail you or lead you astray. You have circled this old mountain long enough. It is time to ascend and come up higher and trust that the steps that I order for you ascend and are not flat lined. Each one of them will bring you higher and you will not be bored, unfulfilled or unproductive, says the LORD. I receive and believe it! Thank you! Amen., my Lord as your delicious Invitation Voice , through i often blinked , forgive me , i will never leave you ! Yes , come up higher where no dragons dare abide ! !